Announcements > How Connected Are You? When you’re connected, you’re better able to become a part of the community. Staying informed to local happenings is easier. Volunteering your time or serving as a community leader more naturally fall into place. This is one of the many reasons we believe that connected communities become thriving communities. When you personally are connected, you are automatically part of it. We live in rural America where, I’d argue, connection is more important here than ever. Connections help keep us living comfortably in the rural lifestyles we’ve chosen by helping us better do business, get an education or simply communicate regularly and easily with those we love. 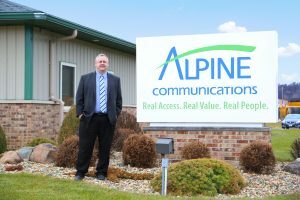 One of the biggest obstacles standing in our customers’ way is simply not understanding the spectrum of services offered at Alpine Communications. Too often, they don’t explore what’s new or take the time to update their devices. Not taking full advantage of their broadband network. In the world of technology and communication, everything is changing so rapidly. What might have been new or up-to-date only a few short years ago could be now dated and behind. Not updating devices. Updating your devices, like your router, are crucial to ensuring your security and personal data are as protected as possible. Take the time to inquire with us about the devices you’re using within your home so you can have the peace of mind that your information is safe. Not asking enough questions. At Alpine Communications, we’re problem solvers! Tell us your issue and we’ll move toward a solution. We want you, our customer, to ask more questions about communication needs so we can better serve you. We pride ourselves on being an open book, transparency, listening and providing honest answers. What communication needs do you have that we could help with? What question do you have that you’ve been too shy to ask? Get in touch with our customer service team and we’ll be happy to tell you everything you want to know – no strings attached.